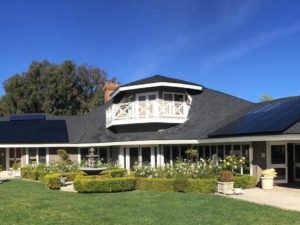 Owning a PV system that powers your home and pool brings a certain magic to one’s home and lifestyle. Clean, free energy, delivered by the sun, powering lights, AC, appliances, pool equipment, and more. Everyone is different when it comes to keeping things clean. For example, my car rarely gets washed and it drives find, but it looks like hell. I have no problem with this. When it rains, my car looks its best. When it gets really bad, I break down and have it cleaned. A clean PV system, will out perform a dirty one. Some say as much as 10%. So, dirt could be costing you money. Rain does a great job of cleaning. Months without rain, debris will build up. Dirt, grime, bird poop, pollen, and even moss if you pay no attention to your collectors over time. If you have a one story home and your PV system is in clear view, you will know when your system needs some love. It will not look very good and its performance will be hampered. A one story roof is much easier to work on than a two story roof. Its best to have two people to clean the system. One person will have a hose to rinse the collectors and the second person will have a telescopic pole with a swivel on the end that has a firm and flat mop head on it and a soft pad. One person rinses while the other person mops. Before you get off the roof, let the collectors dry to make sure you have not missed any spots. Have a certified ladder that is positioned at a safe angle and is secured at the bottom and at the top. Walk carefully on your roof and never take your eyes off of where you are stepping next. Never walk backwards. Follow all OSHA regulations when working on a roof. Call Suntrek if you would like us to clean your system for you.